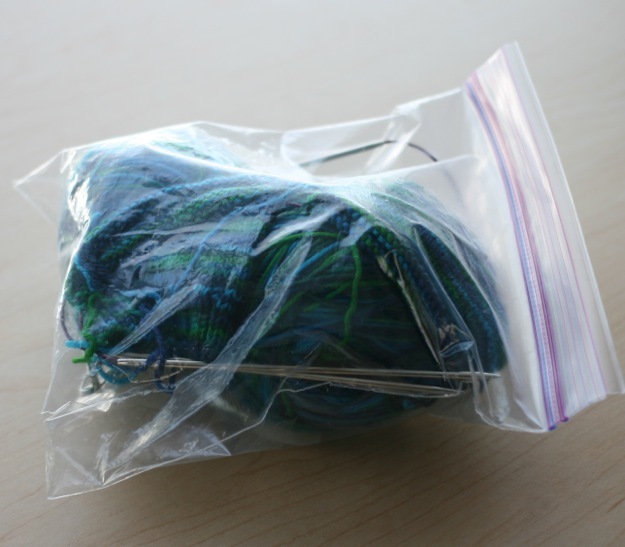 Everywhere I go I carry two bags, my go bag that has my essentials and my knitting bag. Over the past six years or so my knitting bag has grown from a small clutch to an overgrown shoulder bag. My Mom made my knitting bag and it’s pretty spectacular. 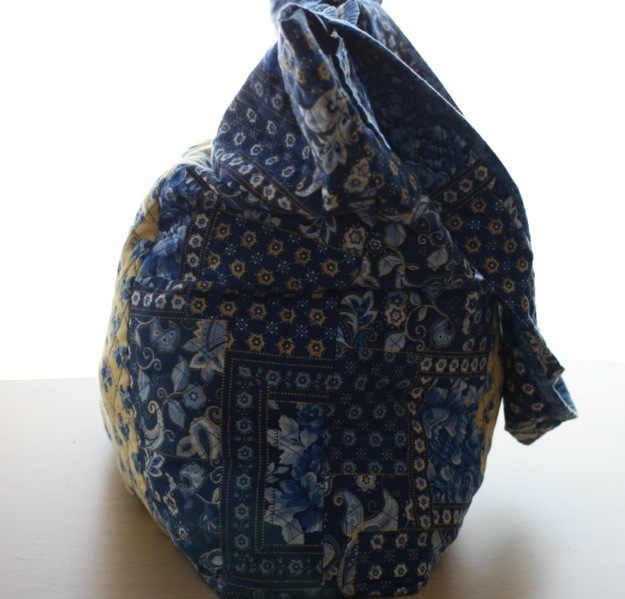 Inside the sides are lined with pockets of varying sizes and the straps are extra wide so they sit on my shoulder properly. The bag itself is very deep so I know I can place projects inside and not worry about anything falling out. 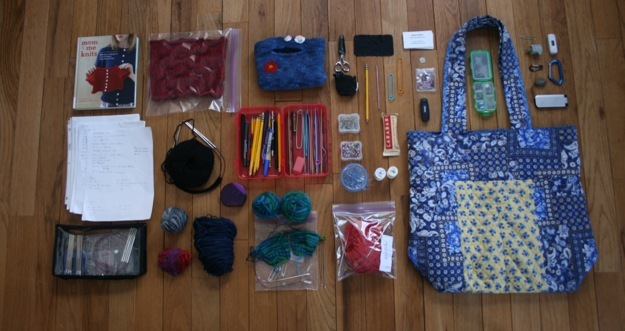 My knitting bag holds the tools I need to complete a knitting project from start to finish, plus some other odds and ends. I thought I would give all of you a peek inside. I know, it is an overwhelming amount of stuff. Let me take you through what I use most. 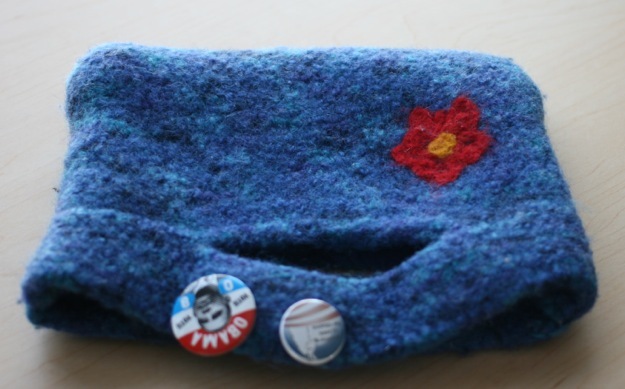 This small felted clutch I knit a couple years ago and my Mom needle felted the red flower. The pin on the right says “Another llama for Obama”. I keep this clutch inside my knitting bag because it holds my most important tiny tools. I thought it was just my Gingher scissors, sheep measuring tape, crochet hook, large stitch holders, safety pins, favorite pencil, and stitch markers, but when I emptied the bag I discovered more. Apparently I’ve been carrying around a rock, a dime and a paperclip. I really wish I knew where that rock came from. This little green notions case is supposed to go in the felted clutch, but I’m constantly tossing it in my knitting bag and then forever having to search for it when I need a sewing needle. My Mom gave me this case and it is invaluable. 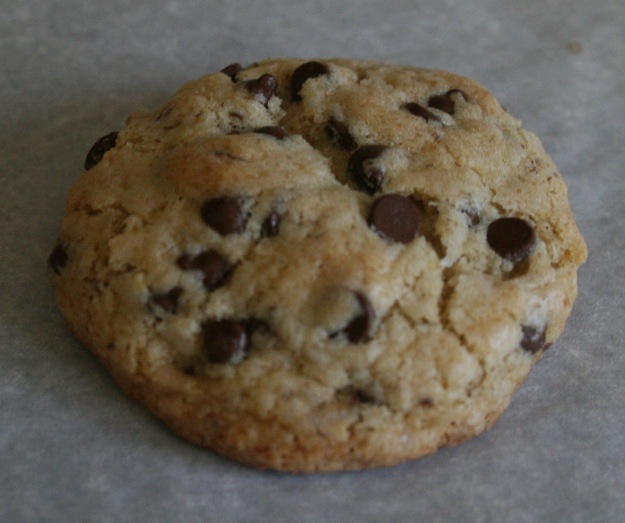 I have no idea what it is called or where to buy it, but if you see one at a store, don’t hesitate. 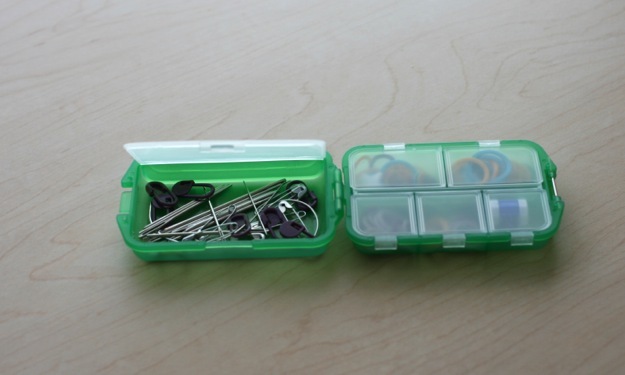 It is perfect for stitch markers, sewing needles, safety pins, and buttons and it snaps shut. About two years ago I upgraded to two sets of Knit Picks interchangeable needles. They are amazing. These needles are flawless. 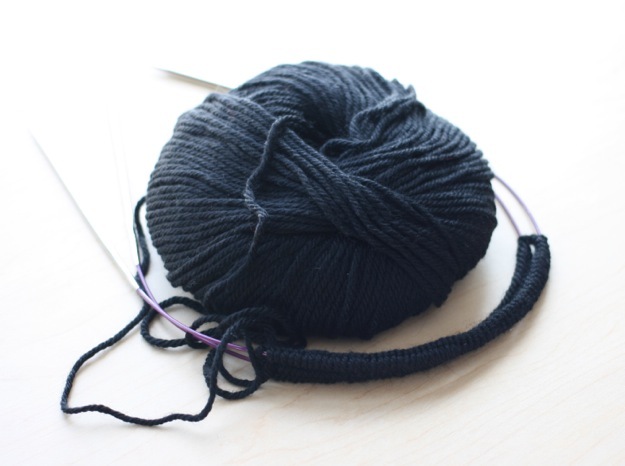 I always know I will have the right needles with the right cable and that my yarn won’t snag. Knit Picks cables are also much easier to use than other brands because they don’t kink. Mr. MVP gave me this pencil case, which apparently is for Stuff Management. 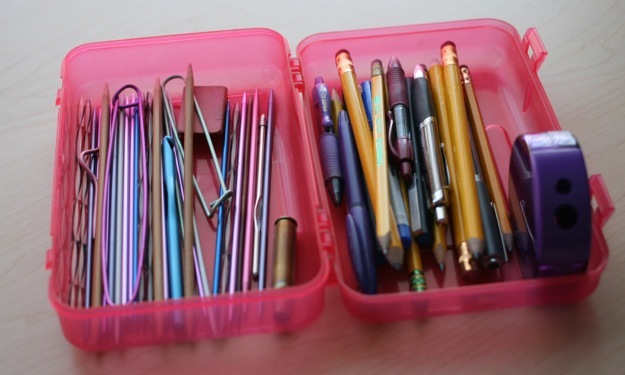 I use it to hold all of my pens and pencils and my extra straight knitting needles, stitch holders and crochet hooks. 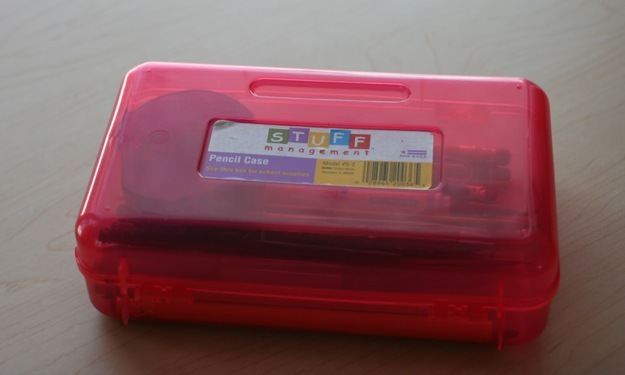 I also keep my large eraser and my pencil sharpener in my pencil box. This is, of course, where I store my old bullet too. 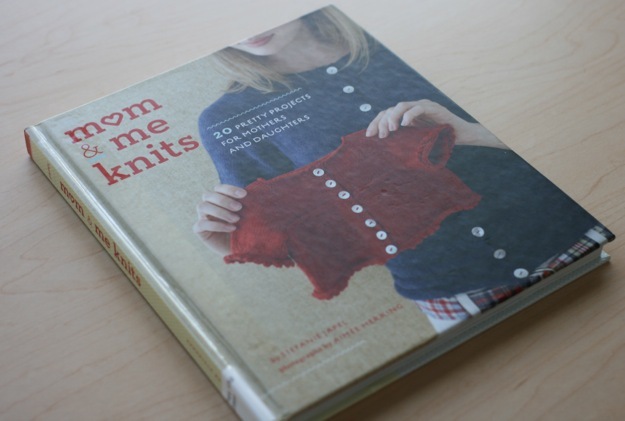 Currently I’m carry this knitting book around from the library because I’m obsessed with the sweater patterns. I think I have picked two sweaters to knit and give away to a very lucky new Mom who I am so incredibly excited for. I always have at least two or three projects going in my bag. This project is a secret! These are socks that I have been knitting for about a year, but I always put them off when a new project comes around. My goal is to finish these socks before July. This is the lace cowl I just finished. It is knit with Knit Picks Gloss, which is silk and merino wool. This is a seriously fantastic cowl. The partner to the cranberry cowl above is this black one that I just casted on. As soon as I finish this one they will go in the mail and then I will start on the baby sweaters from the library book. In the side pockets I always keep straight pins, white thread and clear thread. 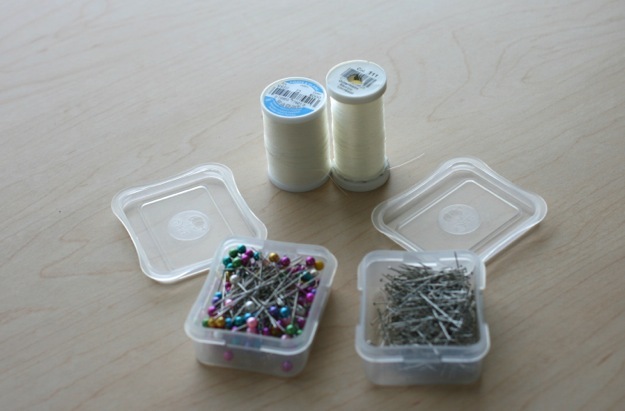 These tools seem like they would be more helpful for a seamstress, but I do a lot of sewing with the children’s hats and pins and thread are essential. 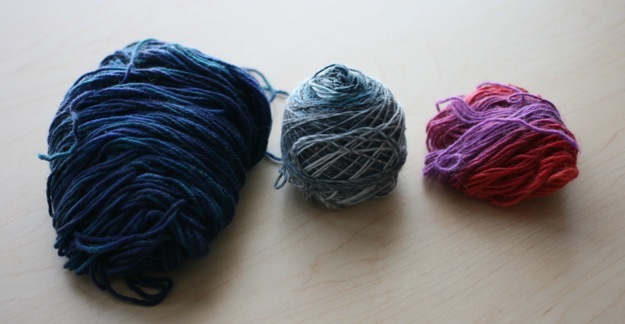 In the next pocket I found this trio of sock yarn. It honestly serves no purpose other than to show how much yarn is leftover when I finish knitting socks. 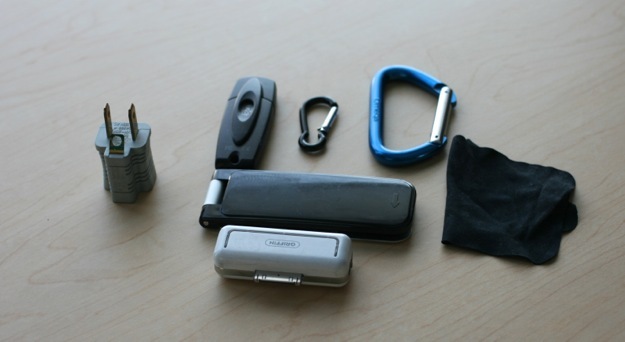 In each of my bags I have a sort of gadget pocket. 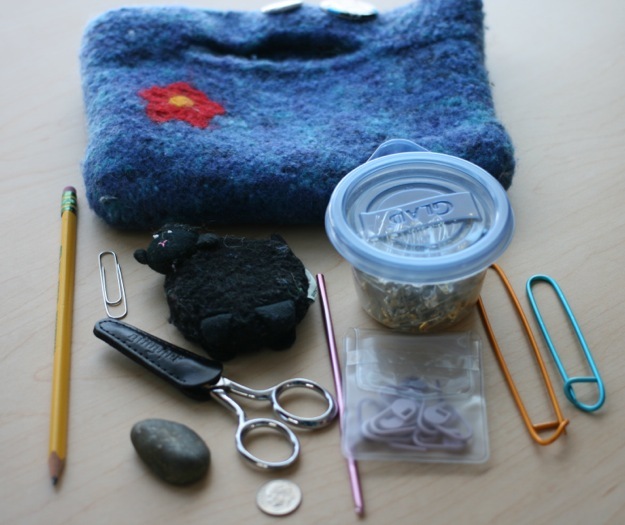 In my knitting bag that pocket includes, for no specific reason, a plug adapter, a memory stick, two carabiners, a lint brush, a radio transmitter for an iPod and a microfiber cloth. As I said, it is a collection that is there for no specific reason. In one of the top pockets I always carry business cards. 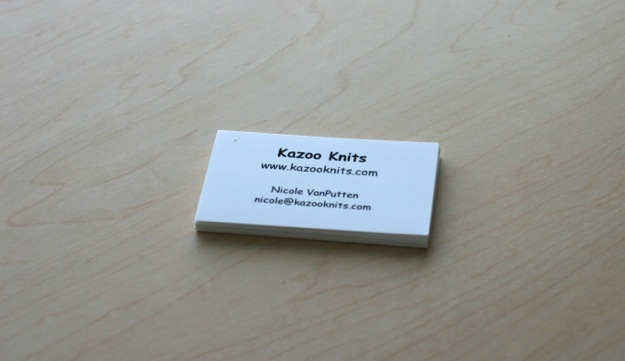 People are always asking me if I can knit certain things or what I charge, so I like to have these cards handy. 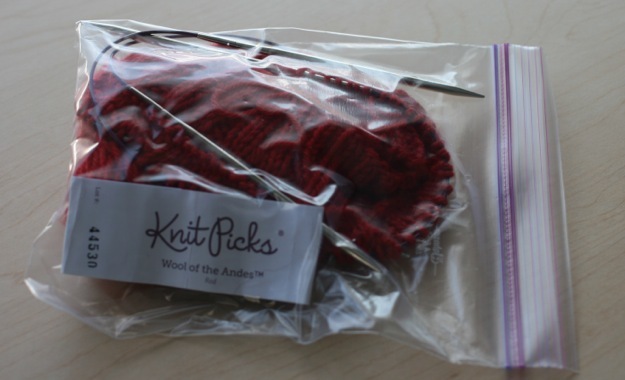 I also attach one card to every item I knit with care instructions, so I always need cards with directions on the back. 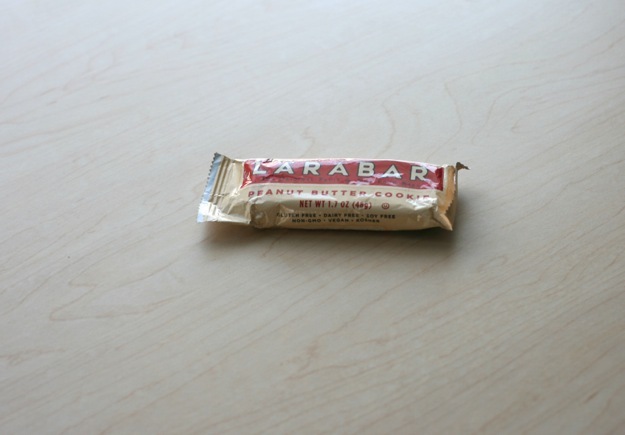 In both of my bags I keep a Larabar because they are delicious. 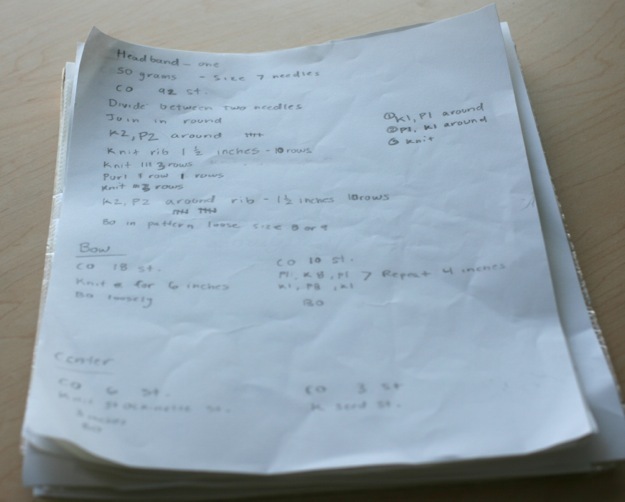 At any given time I have a stack of patterns and blank paper. I am always working on a new pattern or in the middle of reworking an old one. 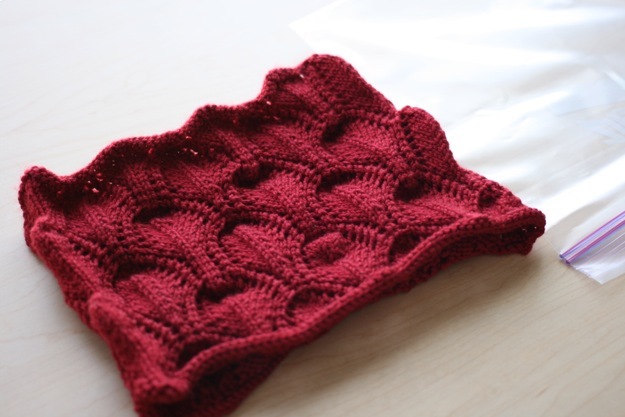 Here is a pattern for a headband. This is what one of my patterns starts out as. I like using paper and pencil because I can erase mistakes and easily rework lines I did not like. This headband has a bow on it that took me hours to get right. Mr. MVP Behind The Scenes! 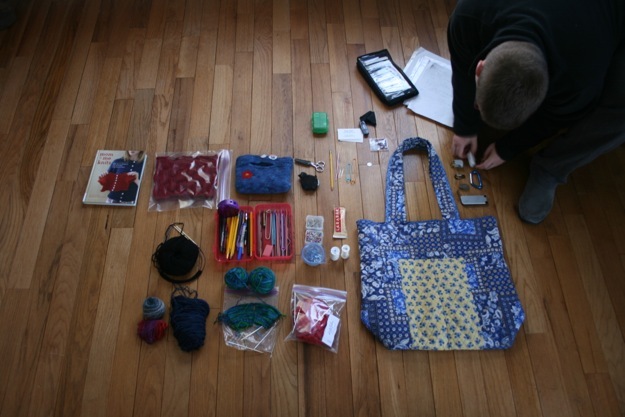 My knitting bag may not be as important as my go bag, but I certainly could not start a project without it. 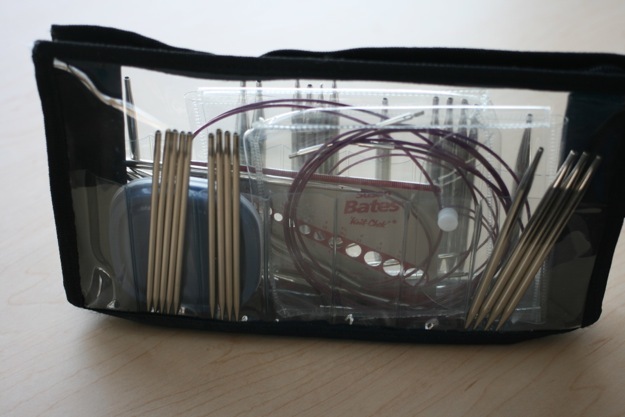 It hold my tools, resources and tricks that I have accumulated and found to be the most helpful in my knitting. I would be lost without it.